Then you will understand how to fear the Lord, and you will discover knowledge about God. Teach me to fear you God. Let me fear you so I learn wisdom and understanding. Categories: devotions, god, gods heart, pray to God, time for God | Tags: fear, knowlege, Understanding, verse of the day, wisdome | Permalink. 8 But it is a spirit in people, the breath of the Almighty, that makes them understand. I remember at times, thinking, “I don’t feel sorry for them. They got what they deserved.” However, who am I to judge a person? I may not have all the facts. Even if I did, I am not to judge others. I am to have compassion, instead. Our flesh is of man’s thoughts and teachings. However, our spirit is of God’s thoughts and teachings. To understand the difference we must have our heart listen to God’s guidance. From the day we are born, until the day we die, we live in a world filled with selfish thoughts. Our world thrives on self-pleasing and self-preservation. If anyone hurts us, we, naturally, want to hurt them back, or at least we want them to have a piece of our mind. We go through life with the understanding that we are not to be treated harshly nor should we be disrespected. If anyone does us wrong, we want to get back at them, we want to get things straight, we want to resolve it. However, we are limited, in our resolve, by our carnal understanding of what is fair. 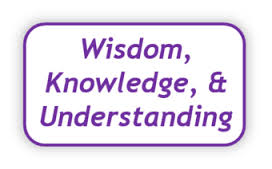 Whereas in carnal understanding we depend on our own thoughts, in spiritual understanding we rely on God’s thoughts. He speaks to our hearts through the Holy Spirit within us and helps us discern. It is the spiritual understanding in each of us that allows us to show compassion instead of despise, love instead of hatred, kindness instead of meanness. We no longer rely on our own actions of righteousness, but on God’s expertise in the matter. He intervenes with our human nature, and allows his spirit to prevail. 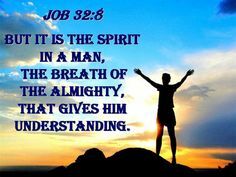 For it is his spirit in us, his breath of understanding, that should think and act for us. Let our fleshly understanding die each day, so that our spiritual understanding may live forth. Let us be a godly example filled with love, compassion, and kindness towards others, so that Christ in us will show outwardly and win others to join in the family of believers. Let not our carnal understanding be a stumbling block to those that may be wavering in faith. Categories: devotions, guidance | Tags: Biblical inspiration, Christ, God, Holy Spirit, Jesus, Understanding | Permalink.